RefactorBuddy is a tool for refactoring code, markup, etc, which is based around a core function of Find & Replace over a directory tree. If you have not already done so, please read the general terms under which this program may be downloaded and used. 2008-08-26: Version 0.2 - Restore from backup. 2008-09-10: Version 0.3 - EasyEx type definition. 2009-03-15: Version 0.4 - Renaming of directories and files. 2010-07-14: Version 0.5 - Load/Save pattern sets. 2011-12-10: Version 0.6 - Replace/Skip Directory and copy results to clipboard. 2013-08-21: Version 0.7 - Allow history logs to be reloaded as a pattern set; Enhanced file tree with include/exclude patterns; Enhanced filename patterns; several fixes. The find & replace engine utilizes EasyEx pattern matching technology, used with the permission of Advanced BusinessLink Corporation. Easy expressions are an alternative to regular expressions, designed to be far less cryptic to build and comprehend. Note that full help text is not planned until the 1.0 build, although some basic help for using EasyEx is currently included. Loading and saving sets of patterns. Multi-pattern find and replace with compressed archive backup. 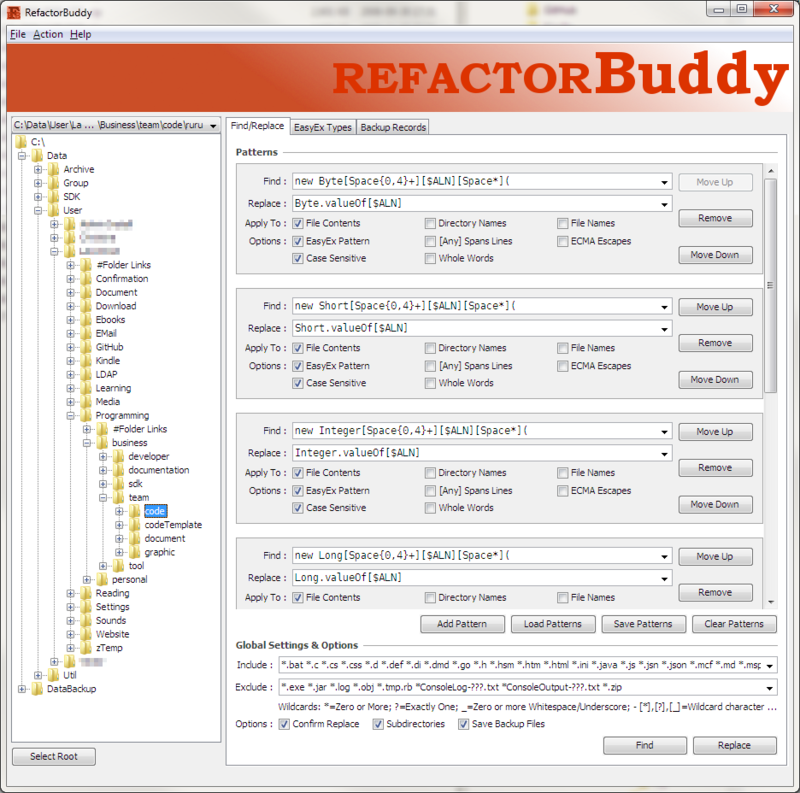 Download latest version: RefactorBuddy 0.7, or the previous stable version: RefactorBuddy 0.6.4. This program requires the Java Runtime Engine, V6 or later to run. The JRE need only be installed once to run any number of Java applications. If you are unsure whether you already have the JRE installed you can check it on the Java website using the “Do I have Java?” link. The program uses the current directory for any files it acesses including the logs and backup archives that it writes. The easiest way to run the program is via a shortcut, launcher or script that sets the current directory to any desired location within your user profile’s data directory. Alternatively, the simplest installation is to drop the JAR executable directly into the desired data directory. This is an ideal way to trial the program; it can be moved to the long-term program location at any time in the future without affecting any existing data. Guest comments are welcome - Use "Pick a name", then "I'd rather post as a guest", below. All material copyright unless explicitly stated otherwise.